Recently, TDS Telecom President and CEO, Jim Butman decided to challenge job-seekers and future professionals alike to take a look at TDS. It’s no secret; CEOs nationwide are facing record unemployment levels, coupled with a widening skills gap. I know he means this, because the same goes for employees here, too. In fact, 40% of the company’s open positions are filled by existing employees—He wants people challenged and looking ahead to what’s next, whether it’s helping to grow the business or finding growth in our own careers. To put his money where his mouth is, TDS recently launched a new, three-year program called TDS Telecom University where a subset of future leaders can take on a new job each year within the organization to gain new perspectives on the overall operations within our complex tech company. It’s true—we’ve grown increasingly quickly, acquiring cable companies, launching new products, and building new fiber optic networks. Once a collection of small rural phone companies, TDS now provides world-class internet service and next-generation television and voice services throughout the U.S. In fact, we’re now a major player in the Internet Service Provider (ISP) world. “Of course, I have a unique perspective. I’ve seen TDS transform our business many times, but never before have I been this excited for our future. 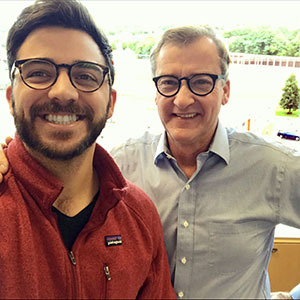 The industry has been undergoing a fascinating transformation powered by new communications and entertainment technologies and our employees are embracing the challenge,” Butman adds. The culture at TDS is inclusive and challenging in all of the best ways. Recently recognized by Forbes as one of America’s Best Employers for Diversity, TDS has an active network of employee groups, which includes: patriots, interns, women in tech, and emerging leaders. As a millennial, I can attest to the genuine, growth-centered culture of TDS. It’s a real company for real people, and your colleagues are being authentic when they say they want you to succeed—often they’ll do everything they can to make sure of it. On top of this, the company is headquartered in Madison, Wis., one of the best small cities in the U.S. We also have satellite locations across the U.S. in beautiful cities like Bend, Ore. and St. George, Utah. I don’t see nap pods, but I see hard-working, well-rested colleagues who don’t need them. We may not have a Kombucha tap, but we are provided four paid hours per quarter to volunteer with a nonprofit of our choice. I don’t see beer coolers in the office, but I see my friends for happy hour on the Capitol Square on Fridays. I don’t see a company full of people only my age, but I see my career growing as a result of being surrounded by a mix of all ages, with quality, experienced mentors to help me along the way. I see myself working at TDS for a long time (which I’m told is a rarity for people my age). I’ve surprised even myself with how invested I’ve become in the company’s future, and I won’t take this sense of purpose and determination for granted.